The best description I can think to give of Before I Fall is Groundhog Day meets Mean Girls. The main character, Samantha, and her friends are the high school girls that you love to hate: they’re popular, mean, pretty, shallow, and have a strong sense of self-entitlement. From the outside, they’re living the perfect life – until one day changes everything. Lauren Oliver’s writing is beautiful. Everything is described so well that you won’t just visualize it; you’ll experience it. All of the characters are so real – multifaceted and flawed with authentic teenage voices. Kent in particular was such a wonderfully crafted, unconditionally loving character that he has been added to my ever-growing list of book boyfriends. While I honestly didn’t like Sam and her friends at the beginning of the book, I found myself quickly sympathizing with them as they became more self-aware and adjusted their personalities accordingly. 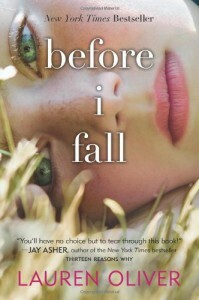 Before I Fall touches on many important themes: grief, loss, change, forgiveness. It teaches us that even the smallest actions can have drastic effects – both on our lives and the lives of others – and that we shouldn’t take anything for granted. By the end of the book, you’ll find yourself wondering what changes you would make if you were given a second chance. This review can also be found at The In-Between Place.